View cart “Speccy-tacular” has been added to your cart. 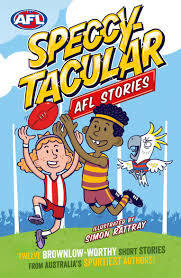 Lace up your boots, pull on your guernsey and get ready to hit the field running with these Brownlow-worthy AFL short stories! Two goals worth (that’s 12 stories!!) of action packed afl footy action. Whoever you barrack for, there’s a story inside this book for every footy fan.